A solid group of 30 athletes will represent the Lynnville-Sully girls track and field team this spring. The Hawks have a blend of experienced returners and new faces that altogether bring a wealth of ability to the team. “We’re looking forward to being highly competitive and enjoying a successful season,” noted L-S Head Coach Darin Arkema, in his 11th season at the helm of the team. The L-S girls have been practicing for several weeks, but factors like the weather, the basketball team making it all the way to the regional final, and Spring Break this week have influenced who can make it to practice and whether practice is indoors or outdoors. Coach Arkema has encouraged his team to work hard regardless. 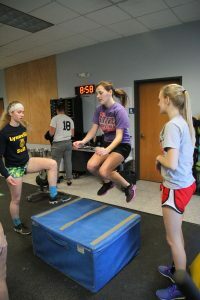 Sophomore Ashton Thompson works on her vertical jump with junior Kaylee Maasdam and freshman Cally Gibbs looking on. The Hawks welcome back three state qualifiers: Sophomores Abby Gruver and Mallory Loftus and senior Camryn Russell. Among the newcomers are 10 new freshman as well as a handful of 10th-12th graders who weren’t out last year. Even with the strengths the girls have going for them, Arkema knows the success of the team still boils down to the daily effort given in practices. “All those things I mentioned as strengths don't matter if we don't show up each day to work and improve,” he added. And it’ll take a hard-working team to be competitive in the strong SICL Conference this year. In recent years, numerous individuals and relays from the SICL have been state champions or state meet place winners. The Class 1A team champion last year was conference team Sigourney, and they return a wealth of talent from that group. Junior Kaylee Maasdam and senior Christine Nikkel practice a relay drill during indoor practice on Tuesday, Mar. 13. As the Hawks get rolling on another season, Arkema has reminded the girls of the goals he sets for every season: To keep everyone on the team out the whole season, to be strong as a team not just on the track but academically too, and to be a team in and out of practice. The girls open the season at the SICL indoor meet at Grinnell College on Monday, Mar. 19. The first outdoor meet will be Tuesday, Mar. 27, at Belle Plaine.